I have in the past tried resharpening jointer knives on a stone by hand, but without much luck. 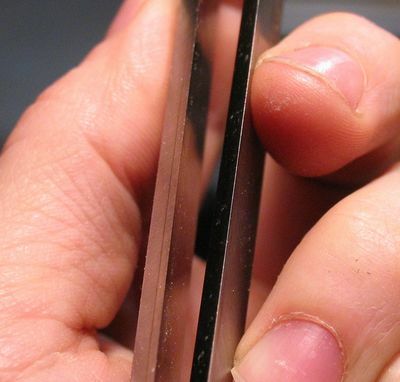 The steel is too hard, and too much material had to be removed for the stone to make much of a difference within a reasonable amount of time spent sharpening. 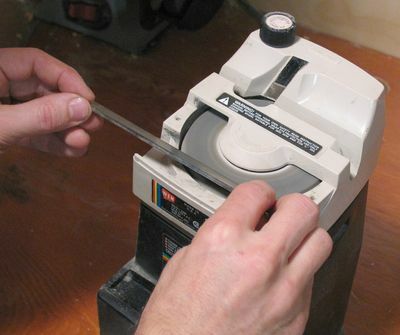 My dad however, living in Northern Ontario, far away from a good sharpening service, has been resharpening his jointer and planer blades himself using a high speed grinder with a vertical axis, similar to the one shown at left, but bigger. I found this grinder for cheap at a yard sale, so I decided that I should take another stab at resharpening jointer knives myself. This time, with a fast running grinder, I had much better luck. The grinder is actually a wet wheel, but it runs at 1700 rpm. The water pump on it is dead, so I always wet it with my fingers. It's a very fine grit stone, so it's safe to touch while spinning. The stone however doesn't remove that much material, so I sharpen the edges to a lesser angle, which means I only need to remove material near the edge. Of course, eventually I'd have to cut away from the whole width of the blade, but I only use this technique to resharpen the blades once or twice between sending them away for resharpening professionally. That way, the edge does get straightened and cleanded up. My technique doesn't remove nearly enough material to grind out nicks either. 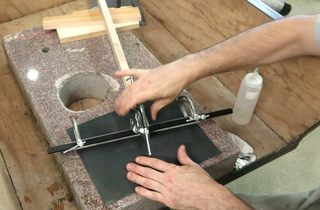 The whole idea is to use this technique once or twice between getting the blades sharpened professionally. Even with me grinding the blades at a slightly different angle, it still takes quite a bit of grinding to restore the edge. The best way I found to check if I'm 'done' is to see if any light is reflected off the top of the blades. The blade at left is a professionally sharpened with a good edge, while the blade at right is in need of sharpening. 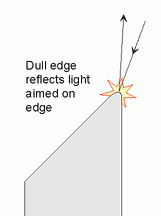 You can see light reflected off the edge on the blade at right, but none on the very pointy edge at left. The other thing to check for is to make sure the blade's edge is still straight. Holding it against something straight and flat, and shining light at it from the back easily reveals if the blade is not straight. I use a piece of black anodized aluminium that came from some piece of equipment I disassembled years ago. Aluminium extrusions are in general remarkably straight, as is cold rolled steel. 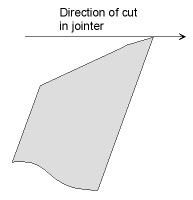 But a jointer table will certainly do also for checking straightness. It's just a little less convenient. 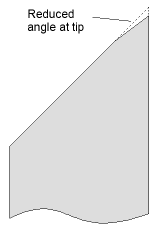 The blade shown here has nearly 0.1 mm deviation from straight, or about .004". 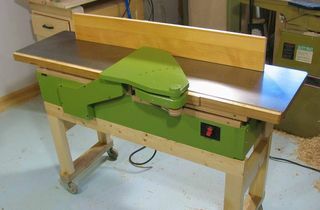 It came with my brother's used jointer. I did my best to resharpen it with my procedure for a test, but really, these blades need professional resharpening. That said, when I put the blades back in, they worked a lot better than before. But you could still see the effects of nicks in the blades on the planed wood. Here's what my resharpened blades look like. They are shiny, though not as consistently so. Note that I'm shining the light on them so that the normal bevel reflects back at the camera, as opposed to shining the light right onto the edge. So in this case, reflections are good. with the light straight on. the bright part along the middle of the board is actually the light reflected on account of the planed surface having a bit of a shine to it. Running my hand over the board, I could not feel the diagonal streaks, as these are not so much waves in the surface, as they are changes in glossiness. Running a piece of hardwood over the knives straight resulted in a surface that was silky smooth to the touch. So really, this check of running soft wood over at an angle is more for obsessive perfectionists, as it is likely to make you feel dissatisfied with perfectly adequate blades. 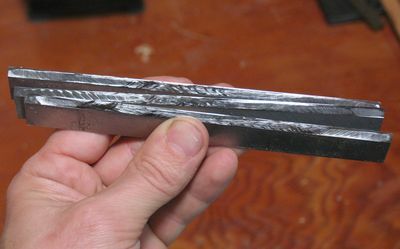 Although I suppose this tough test could be useful for comparing different sharpening techniques, or maybe even different jointers.